X-ray photoelectron spectroscopy (XPS) is a surface-sensitive quantitative spectroscopic technique that measures the elemental composition at the parts per thousand range, empirical formula, chemical state and electronic state of the elements that exist within a material. XPS spectra are obtained by irradiating a material with a beam of X-rays while simultaneously measuring the kinetic energy and number of electrons that escape from the top 0 to 10 nm of the material being analyzed. Running the X-ray source and electron analyzer requires high vacuum (P ~ 10−8 mbar) conditions in the analysis chamber and, therefore, conventional XPS is possible only under UHV conditions, making it difficult to conduct investigations of surfaces under real-world conditions (i.e. in the presence of gases and possibly liquids), such as is the case of interfacial chemical reactions in catalysis, chemical vapor deposition, electrochemistry and environmental chemistry. Near Ambient Pressure XPS (NAP-XPS) is an XPS system capable of operating at pressures of a few tens of mbar. We can now probe chemical interactions on the atomic level for vapor/solid interfaces. NAP-XPS also allows the investigation of the electronic and structural properties of small organics. 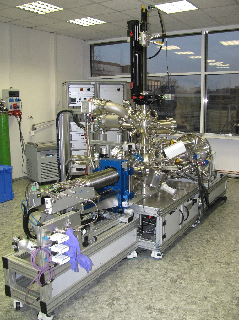 Custom-built NAP-XPS (SPECS Surface Nano Analysis, GmbH Germany) is equipped with a PHOIBOS 150 Hemispherical Energy Analyzer coupled with a differentially pumped electrostatic pre-lens system. A reaction cell installed in the analysis chamber with a base pressure of ~10-10 mbar allows, via a chamber-in-chamber design, in situ XPS studies at pressures ranging from 10-10 mbar up to 20 mbar, and temperatures ranging from -200K to 1000K. The NAP XPS facility is equipped with an electrochemical cell, preparation and load lock chambers, a sputter gun, LEED, a flood gun and a monochromatized Al Kα X-ray source of high intensity. More technical details will appear as they become available for release on the instrument’s webpage.